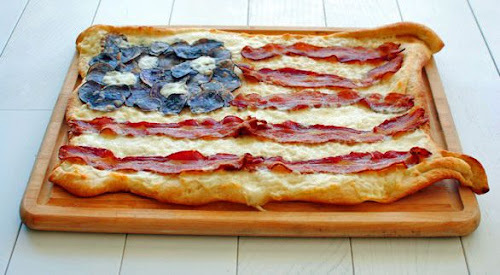 If Americans don’t have a flag handy for the waving, the next best thing is a strip of bacon! Tablespoon contributor bevcooks combines the best of both worlds to pork up the patriotism at the party table this fourth of July with a recipe for Bacon Flag Pizza. If you’re wondering what’s providing the blue hue, those are “crispy little blue discs of freedom,” (aka, purple potatoes), so unless you always eat suspiciously foreign-looking taters, you’ll want to add those to the grocery list.